The story of The Third-Class Carriage, otherwise known as Le Wagon de troisième classe, is that of a family. Three generations are present here: young, middle-aged and old, almost as if it were the full spectrum of human life. Grown men are most notably absent, suggesting that these women are making their way in the world on their own. Although the mother's face is sweet, the weariness present in the grandmother's face suggests the hardships that she must have experienced in her long life. Her shrewd face confronts the viewer. This work of art can also not be separated from the man William Thomas Walters and the Walters Art Museum that he founded. It was William Thomas Walters who commissioned Daumier to paint The Third-Class Carriage. It is one part of a three-part series which also includes The First Class Carriage and The Second Class Carriage. While these three works were given equal prominence and attention by Daumier, it is only the third and final picture which figures among Daumier's better known works. Furthermore, Daumier was primarily a lithographer because he could not make a commercial success of himself as a painter and The Third-Class Carriage is one of his few recorded painting commissions. William Thomas Walters grew up in humble circumstances in a small town in Pennsylvania in the 1820s and 30s. He made his money as a grain merchant and soon expanded his business with a liquor house. Although a shrewd businessman, William Thomas Walters also had a passion for art. Once he was able to afford a nice house in a fashionable part of town, he began to collect works from local artists. Walters grew up with the increasing turmoil that preceded the Civil War in the United States. Although a Northerner, he vehemently defended the right of the Southern states to secede from the union. When the conflict finally erupted in 1861, Walters was left in an unenviable position and decided to leave the country for Paris with his family. In a city such as Paris, Walters continued to collect art although his income was more limited than it had been before the Civil War. He was unique among his contemporaries due to the fact that he preferred contemporary art, rather than the favored historical styles. Ironically, contemporary art during this time period was shifting from a historical to modern focus. Walters principally collected from three artists: Jean-Leon Gerome, Antoine-Louis Barye and, of course, Honore Daumier. It was during this period that Walters commissioned The Third-Class Carriage, along with The Second Class Carriage and The First Class Carriage. 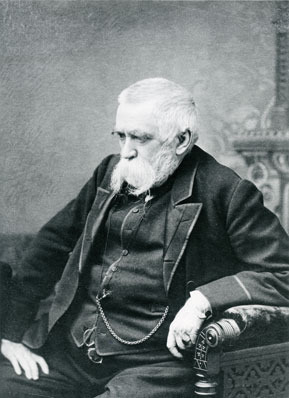 Upon his return to the United States in 1865 at the end of the Civil War, Walters disinvested from liquor and placed his money in banking and railroads. Undoubtedly, this is why Walters took enough of an interest in the life of his would-be passengers to commission this painting. Also, as someone who had risen from a humble to a rich background - along with experiencing the in-between along the way - Walters probably commissioned this painting in part so that he would not forget where his roots. Even though Walters was now a part of well-to-do society, he still remembered that there were other parts of culture. Even though he sat in the first class carriage, Walters still wanted a record of those in the second and third classes, perhaps to prove to himself that they still existed.